has been shown under german RZV judge Eva Preisinger and received very good with no faults. Also passed temperament test under same judge. 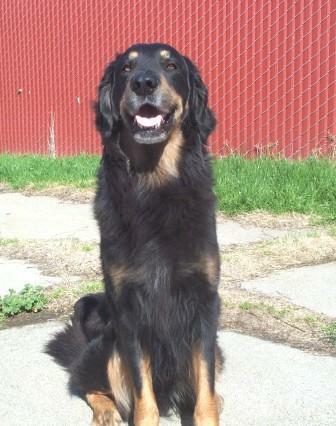 Registered with RZV/FCI/AKC and rated as excellent at the AHC show in 2007. Chara 10 1/2 years old having fun in Rally class in 2011. In all our AKC trials he always passed and always ended up in the first 3 places. Lots of first place ribbons. 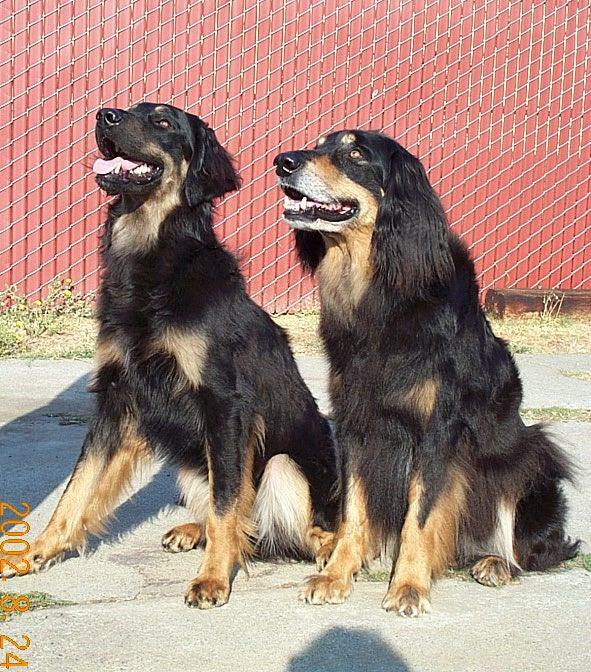 Chara has passed all the breeding requirements for the American Hovawart Club. They include passing a Behavior/Charakter Assessment and show/physical exam. He was rated as "recommended for breeding", which means his scoring was above average. In Addition he passed the GSDCA temperament test and in the BH his charakter will also be assessed. 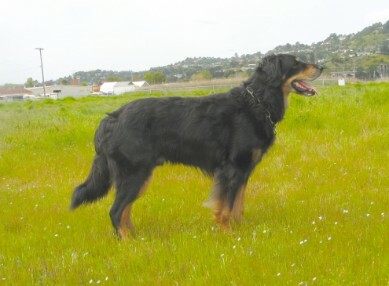 In June 2010 he also received his CGC. In December 2010 Chara earned his FH2 with a great score of 93 at the age of 9 1/2 years. In March 2011 he earned his Rally Novice title with the AKC. In April 2011 his Rally Advanced title. In November 2011 Chara finished his Rally Excellent! As a guard he is very serious but once I invite people into my home he will love a tug game with the guest with his favorite tire. Chara is out of my last litter and was weaned onto raw food. Never had kibble in his life. At this point of his life he is very healthy and still very active. Despite his age he is still full of energy and loves to go on runs where he always leads out about 50 yards and more and doesn't slow down. He also will chase a ball, loves to tug hard and swim. Chara loves to be with his people and loves being close. He also is great with other dogs. Has met intact males on our walks and there never was a problem. He also had several males as playmates at his home. He is a strong boy and loves to tug hard with you and he loves to growl and make lots of noises. He is a big talker in general and even will howl on occasion. He is a joy to walk on leash or off. Walks right next to you on leash. Off leash he will run far ahead if I let him, but will come racing back to me when I call him.